Joan Catherine Vine (later Rawlings) (No.4 in the list of female British team members) was born to Albert and Emma Vine in the Shepherd's Bush area of London in 1931. Growing up in that area Joan regularly went to the Cricklewood roller rink, just a few miles west along the Uxbridge Road on the "Broadway" section of the A5. Also frequenting the rink at that time were budding young speed skaters such as Denis Hill, John Whatley and Ken Rawlings, all training hard alongside the likes of more established speed skaters, Geoff Sanders and Don Brown. 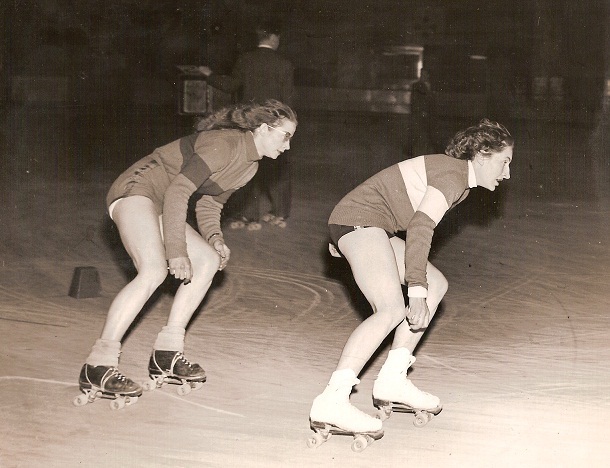 Joan was struck on just how fast these guys went and decided to give speed skating a go herself and in 1949 aged 18, Joan, having now joined the Broadway roller skating club also joined the National Skating Association (NSA). The Broadway club already had established women skaters, most notably Yvonne Brod and Joyce Robinson. Brod was an exceptional speed skater and by the time Joan joined Brod was already a double British Champion. Joan was in good company, and over the next few years she too would emerge as one of Britain's top women speed skaters. The Cricklewood rink closed its doors as a roller skating venue in 1950, but the club continued by securing training days at the nearby Alexandra Palace rink. 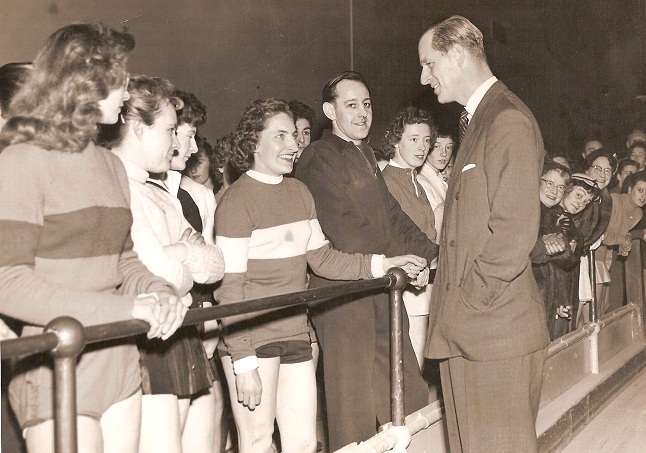 Having trained hard throughout the winter of 1950, Joan's first taste of standing on the podium cam on 7th April 1951, when in the Half Mile Open Handicap for the Vi Kirby Trophy she would finish a close 2nd behind Brett of Rochester United. The Herne Bay rink was small and tight as tracks go which did not really suit Joan, but her 2nd place showed that she was versatile if nothing else. Almost 12 months later Joan was to have her first taste of victory. 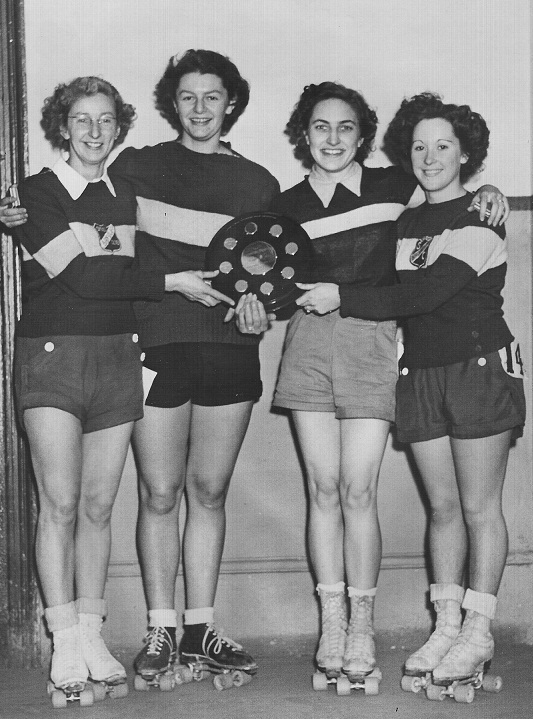 The Ladies Lee Cup hosted by the Alexandra Palace club was held on 8th March 1952. Off a handicap of 50 yards Joan won the three-quarter mile event ahead of Sylvia Mason (mother of the famous England cricketer Phil Tufnell). A few weeks later and she was to medal again, this time a silver in the Anderton Cup. Joan started the 1953 season where she had left off. On 10th January she won the Carlton Shield and then on the 22nd February secured another gold in the Christopher Cup ahead of team mate Yvonne Brod. 1953 was also to be a pivotal year for Joan on a personal front. For some time now she had been courting one of her fellow club mates, Ken Rawlings, and that year the couple decided they would get married. Later that year Ken would make the national team for the very first time and along with other great names of that era, Les Woodley, Denis Hill and Peter Wimble he would go to Venice Lido and try and come home World Champion. The year was also notable for the fact that this would see the very first World Championships for women held. Despite her recent good form Joan was overlooked in favour of a trio of women all heralding from the Birmingham club, Pat Kirkham, Marlene Worrall and Doreen Aspley. In fact, even the travelling reserve, Pat Harris (later Eason) was from Birmingham. Undeterred, Joan continued to train hard. By the time selection for the 1954 World Championships in Bari, Italy, came around Joan had still to find a podium finish in any domestic race that season, however, her form was such that inclusion in the British team was secured. Not only that, but Ken was also selected and for the very first time Great Britain had a husband and wife in a national team. On October 23rd Joan took to the track in Bari amongst the other nations taking part in the first women's event, the 10,000 metres. It was the longest distance for women at that time and the first time a women's World Championships had been held on a track. The track was a small (100 metres to a lap) hard tiled affair that did not suit some skaters who were more used to wooden floors. For Joan, however, once again her versatility shone through. In a time of 24 minutes and 25 seconds, Great Britain's very own Joan Rawlings secured herself a bronze medal in a World Championships. It was a remarkable feat for a number of reasons. Firstly, Joan was the first ever British woman to bring home a medal of any colour from a World Championships. Secondly, up until now all medals won at a World Championships for women had gone to an Italian skater. 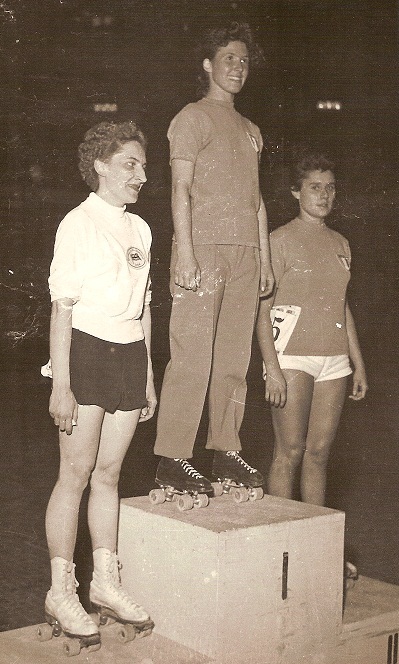 By taking bronze in the 10,000 metres Joan had become the first none Italian female skater to secure a World Championship medal - and not only that, but she did it in the hardest place of all, Italy. The following day Joan would finish 6th in the 5000 metres and just miss out on another medal when she placed 4th in the 500 metres knock-out. She would finish just 3/10 second behind Angela Tassi (Italy) in the race off for 3rd place. Returning home Joan would once again start about her training and resume her domestic racing. A 2nd place in the Christopher Cup on 14th November, and another 2nd in the Anderton Cup on 29th April 1955, showed that Joan was still in top form. Joan continued her training but as the 1955/56 season was in full swing there were more pressing matters at hand. Joan had recently helped Broadway take their first relay medal on 18th February 1956 with a 2nd place on the Birmingham Embassy rink, but soon afterwards Joan and Ken found that they were expecting their first child. In the latter part of 1956 there were two important things happening in the speed skating world. The first was the Barcelona World Championships and the second, and more importantly for Joan and Ken, the birth of their daughter, Janet. Joan embraced motherhood and understandably took a sabbatical from racing for the 1957 season. Ironically, Great Britain elected not to send a representation to the World Championships in Palermo that year so Joan had not missed out on any selection. By 1958 Joan was back into the full swing of hard training. Although the likes of Pat Eason and Barbara Woodley were now seen as being the two women to beat, Joan was still managing to hold her own. On 4th August she would finish 3rd in the Carlton Shield and once more was rewarded with a place on the British team for the forthcoming World Championships in Finale Ligure, Italy. Manager of that team was a man well known to Joan - former Broadway skater, British Champion and World medallist, Don Brown. Over the weekend of 6th and 7th September Joan competed in all three events for women, the 500 metres knock-out, 5,000 metres and 10,000 metres. It was the first (and last) time Joan would skate a World Championships on the road. Her highest placing was 9th in the 500 metres. Now aged 29, and a working mother, Joan started to wonder what lay around the corner in terms of her skating career. Her fellow team mates Eason and Woodley had not fared much better, but neither of them had young family and there were other skaters too, the likes of Chloe Ronaldson and Pat Barnett, waiting in the wings. She may not have realised it then, but Joan would never again step onto a track as a member of the British team. Despite these considerations Joan returned home from Italy and continued to put the effort in to be one of Britain's top skaters. 1959 was a lean year with no podium finishes, and as the 1960/61 season unfolded it seemed to be going the same way when she was bought down in the final of the Lee Cup by Brenda Parish (Birmingham). However, just a week later her fortunes would change and Joan would embark on her best year in terms of medals at British Championships. "Harris (Eason) was away at the gun, followed by Ronaldson, Rossiter and Rawlings. Maureen Rossiter was over-eager and bumped Ronaldson, going wide. Ronaldson, however, put up a great fight to try and retain her title and was certainly not going to settle for second place - and in her efforts to force Harris into making a mistake slipped out to let Rawlings through into second place. Rossiter was disqualified"
And so, after more than 10 years of trying, Joan finally had a British Championship medal to add to her collection. On 11th February 1961 it was a return to Brixton for the Quarter Mile Championship. Again, Joan would win her heat comfortably, this time ahead of Val Jennings (North London) by some two seconds. In her semi-final she would finish a close 2nd to Barbara Woodley (Birmingham), always looking dangerous and keeping Woodley at full stretch. In the final, however, Joan would get the beating of Woodley and take 3rd place behind Ronaldson and Rossiter. So close was the finish that all three skaters were awarded the same time - 44.2 seconds - the stopwatches unable to split the skaters. Joan's priorities were now beginning to lie elsewhere. The rest of the 1961 season came and went with just a bronze medal in the Aspley-Struggles Trophy in April. By 1962 Joan was giving serious consideration to retirement. By the time the season had finished she had made her mind up. 1962 would be the last time Joan Rawlings would step onto a track and race in the blue and white of her beloved Broadway, but not before one last parting shot. On 3rd March 1962 she helped fellow club mates Margaret Livingstone, Joan Parsons and Chloe Ronaldson to a silver medal in the 2 Mile British Relay Championship. Joan may well never have won a British title and she may well never be graced with the successes enjoyed by other British women skaters, but what she did do was pave the way for them. For over 10 years she was seen as one of Britain's top women skaters, always there or thereabouts, finally obtaining the British Championship medals she had fought so long and hard for. Her efforts over the years were rewarded with inclusion into the British team, not once but twice, where she had the opportunity to compete at the very highest level - a World Championships. There is no higher competition. And it was in that competition that she wrote her name into the history books. Not only did she become the first British woman skater to win a World Championship medal, she took on the might of the Italians in their own back yard and became the first none Italian woman to relegate one of them out of a medal winning position. That in itself is remarkable and it is for that feat alone, if nothing else, that Joan Rawlings will always be considered a British Skating Legend.